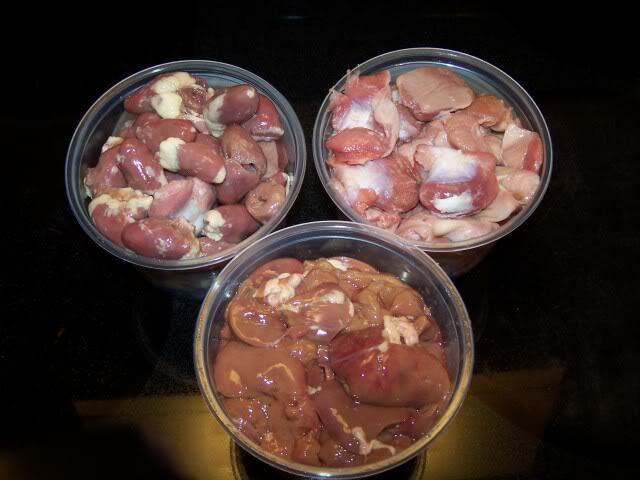 I've never frozen fresh raw chicken livers before, & was just wondering if there was any reason why I can't? Hubby doesn't like them, but for times when he might be dining elsewhere or not feeling well or whatever, I was wondering if I could have a container of them in the freezer ready just for me? They are sold frozen here. I've frozen them with no ill effects. When there is a really great sale on whole chickens, I'll buy a bunch and cut them up, debone them, etc and freeze them for later use. I freeze the livers separately for me. i have frozen them before, the only thing that i notice is that may be lil softer then usually but works good for everything i use them for. Love them saute in butter with onions and put it on just plain ole white bread that also has been butter. ok so not diet friendly but what the heck once and awhile you got to pluge. I freeze one every time I cook a chicken! I wrap it in plastic wrap and drop it into a freezer bag already in there with other livers. When I accumulate enough, I make either pate, chopped liver or crostini with sauteed livers. You can but there's a slight taste change. You might not even be sensitive to it. For the record, I loooooooove liver !!!! .........do it all the time...........no harm.... same with hearts and gizzards! freezing works fine for me. had some couple days ago. i really don't notice any change in them. i love em. Here is my recipe for Chicken Liver Pate. I never have any left when I take it some where, I n fact when I take it to a gathering I alway make sure I save out a lil bowl of it for myself, as everytime I wish I had a lil more when I got home. place into a plastic wrap lined bowl or container refridge till firm and when ready to serve remove from container onto plate and serve with your favorite crackers. I love this hot also. When I plate it I put it on top of plate of large leaf lettuce and then put hard boil eggs wedges -red & green peppers rings around it. Do these look good to go, or WHAT?